Everybody knows that moral norms and laws regulate relations between society and man and relations between people. Actually moral appears as reflection of subjective morality, as inside personality moral. And moral is just an accumulation of historical standards, certain rules that are generally regulate behavior, relations in society. Moral – is a thing with a cultural beginning that is not related to have necessarily nature, with real legal laws that differentiates them against laws. Moral norms is a phenomenon of public consciousness. This is their specificity and their important feature. They distinct from the same tradition and, as above noted legal norms. Traditions – is a kind of historical stereotype of mass behavior in specific situations. But moral norms are more multipurpose, because it is a collection of common norms for people. Also observance traditions are often based on habit and out of fear of disapprobation of others. And moral norms are based on a sense of obligation, on twinge of conscience and on a sense of shame. In order to follow traditions humanity must unquestioningly obey it is requirements. And moral norms suggest a conscious and free choice of each person. 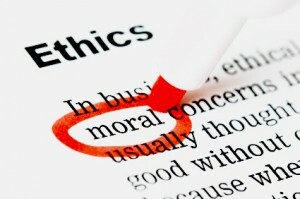 Discoursive legitimation of moral norms in terms of ethics – it is confirmation legality these same norms. Although laws based on morality and some people perceive moral norms as laws, but it does not identify them. The law sanctioned by the government, while moral norms sanctioned by personal beliefs and public opinion. The laws are fixed in laws, codexes, regulations, orders etc., while moral norms are not written. Moral norms are transmitted from generation to generation, from one person to another. If a person does not adhere to legal standards, it comes to this or that type of liability (criminal, administrative). But because of not doing moral standards the person receives only public disapprobation and remorse. Some moral norms are very similar in form to the laws. For example, the rule “do not steal”. In it is turn you can ask the question: “Why man renounces from stealing?”. In my opinion, we can answer to this question in two ways. At first, a person may refuse stealing through their own belief that the stealing – is a very bad deed (the moral motive is present). At second, a person may refuse for fear of a court before obtaining an appropriate responsibility for the crime (not moral motive). But there are a lot of situations where the laws and moral norms conflict with each other. For example, a person feels their moral duty, acts against the law (someone steals drugs in order to save a life). The moral rule-making in the early stages was very closely associated with religion, which removes morality of divine revelation. Also religion interprets failure as the highest standards of sin. It is well known that all existing religions of the world have their own specific set of moral precepts, which are mandatory for all believers. But no matter how different were not religion, but about the moral norms they have no differences. Because, as we know, murder, stealing, lying considered unacceptable in all world religions. Also moral norms affect to the legislative work, because laws formed in compliance with the moral norms that are available in society at this stage of its development, and act as the official expression of justice. There is why the law – is a moral phenomenon in a broad sense. Under the influence of moral norms legal norms are changing, constantly evolving. Also legal provisions cease to exist in case of non-moral resolutions that exist in our society (for example, the cancellation of the death penalty in Ukraine). But the legal norms also have an impact on the moral norms that in their turn manifests itself as follows: legal rules promote and help approve advanced moral ideas, improve modern moral norms; legal norms are a kind of protection our moral norms. I believe that in the country with democracy relations of moral norms and laws are not determined by the presence of certain laws, constitutions, regulations, that have certain footnotes to the criteria of morality. Also their influence on each one, in my opinion, not indicated that the legal norms have a certain content of morality. I think that first of all their relation is manifested in the perceived need to interpret it and use it with regard to critical morality. All these above listed, in my view, is discursive legitimacy and moral norms, because our moral norm becomes a legal, legitimized, begins to wear mandatory. So we can make a conclusion that traditions and discursive legitimation moral norms manifested in the fact that morality and rule they are always complementary. The law regulates the most important system of individual interaction, where for failure to the law follow a punishment. Morality is the same in their turn regulate less important areas of interaction between people, which is for non condemnation of conscience. Law – causes, morality – appeals to duty. This entry was posted in Ethical and tagged moral, norms on 02/03/2017 by Mary.